Quit thinking about it and just do it: behind the mystery of the masks hides the magic of the most realistic and gorgeous decorations... The thing is that using just decals, with their "silvering", their adjustment and grip problems, their decal liquid stains... it just doesn't look the same. And yet we "stick" with them... right? Even despite of the so many interesting decorations available!! Do not despair, do not let this technique scare you, because your kits and their decorations want some masks... urgently!! Let yourself go, Montex Mask makes it a piece of cake with their masks and decals. 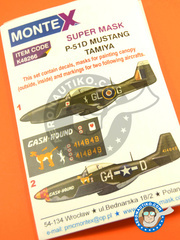 And this week we bring to you nothing less than fifteen new gorgeous decorations for the Bf 109, Fw 190, Spitfire, P-40, P-51, D.520, Hurricane and many more. Two interesting versions for your Spitfire, the first belonging to the RAF 312 Squadron in the late 1944, and the second to the personal plane of Wing Commander Marian Duryasz in 1945. 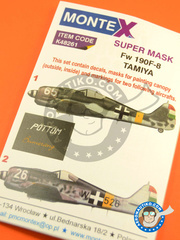 This set features a set of masks for the canopy, another for the USAF markings, and a small decals sheet for recreating both "Whoooooo" and "Balls out" decorations. 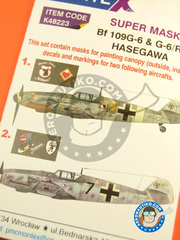 The set includes two vinyl masks for the canopy and markings, and a decals set. 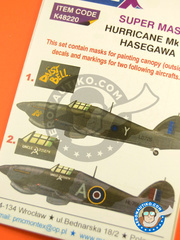 Recreate the Hurricanes flying under the "Daist Bell" or "Uncle Joseph" names during the 40s with the decals and masks from this set. Two awesome decorations for the Spitfire Mk. 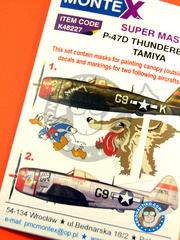 I scale model kit by Tamiya, including a decal sheet and two mask sheets. 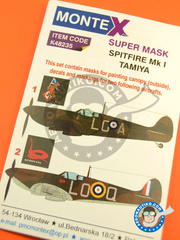 A new product from Montex Mask with two decorations for RAF Spitfires. 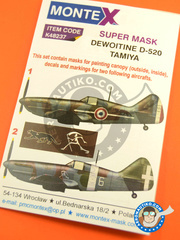 New Montex Mask decals for the Dewoitine D.520, featuring two different decoration of the French air force. 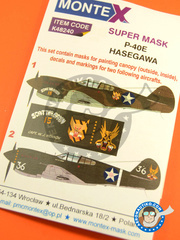 The set includes a decals sheet and masks for both canopy and for carrying out the whole decoration. Two gorgeous decorations from the early 1945. 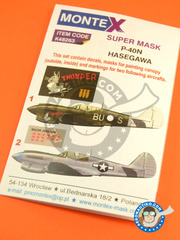 The set includes a decal sheet and two masks sheets for the canopy and the markings. The set includes two decorations for the Wildcat, one of them for the USS Enterprise carrier version, and the other for the Guadalcanal front, both from 1942. 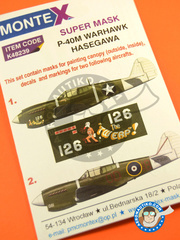 Inside the box, you'll find a decals sheet, and masks for both the canopy and markings. These two decorations are based in the several detachments deployed by the American troops in Australia. 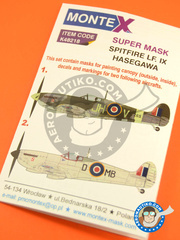 The set includes decals and masks to nail a perfect decoration. 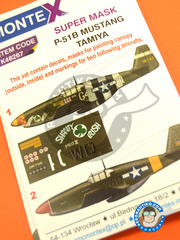 This set features one decoration for the RAAF on August 1944, and another for the USAF on October 1944. Includes a small decals sheet and several masks. 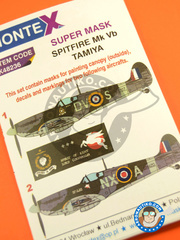 Two very interesting decorations in this reference by Montex Mask: on one side, the decoration of the RAF during the summer of 1944 in Italy, and on the other the decoration of the USAF for the late 1944 - early 1945. 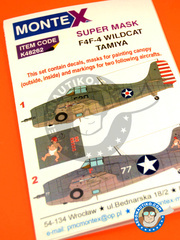 As usual in the brand, the set includes a small decals sheet, as well as masks for the canopy and markings. 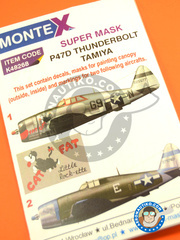 This set features a set of masks for the canopy, another for the USAF markings, and a small decals sheet for recreating the decorations of the "Fat Cat" and "Little Rock-ette"
This set includes a decals sheet for all the three decorations available, as well as masks for the cockpit and the different markings.